School is back in session and the kids are in full activity mode with sports, studies and the never-ending social life! Every kid needs a space that is all their own to come home to and decompress after being out in the busy world. A place where they can look around and be surrounded by the things they love and happy memories to refresh them. This is not the space that my son had. He had a room that he thought was relaxing but was actually causing more anxiety to the end of his day. And, truth be told, if he wasn’t the one getting anxious, it was me! Problem: Messy, stressful environment and the first room that greets you when you come up the stairs at the end of the day. Solution: Create a space that makes everyone happy to see and feels good to be in! I have always just let him do what he wanted (to a point) in his room as far as decor goes. However he wanted to put together his shelves and whatever he wanted on his dresser or nightstand was up to him. He insisted that a folding table was the perfect desk. Not just any table. No, this one was a project table I have used for painting, etc. And his idea of great decor is a stack of empty shoeboxes. Actually, a stack of anything i.e. : clothes, books, papers, shoeboxes. His room actually looks like this all of the time! No lie. And he is fine with it. How can anyone even think in here?? Let alone study or sleep. He was convinced that he had the perfect space…..I knew we could do better. I am assuming that this is just a boy thing. I only have one so I am not sure. Can any of you moms relate? So, I talked to him about giving his room a makeover for the Fall to give him a space that he would love to be in and be conducive to living learning. He was open to the idea and told me he wanted an all modern space. That doesn’t go with the style of our home…..at all. So, I put together a mood board to give him an idea of what I was thinking and he was agreeable to the ideas. I was also able to show him how the ideas fit better with the style of our home. You can find out about how to make your own mood board and find your style here. He was able to have input, see what I was thinking and change what he didn’t like. It is often hard for someone to visualize an idea. Especially if it is someone else’s idea. A mood board is a great way to see all of the ideas in one place and how they go together. I cleared out the room of all of the STUFF. (I have put together a video to show you the transformation that took place. Don’t miss it at the end of the post!) I only left the large pieces of furniture that I would be using again. Which meant that his beautiful, plastic, folding table desk would also be leaving the room. The large bookcase was too big and created a black hole. The shelves were so deep that anything he put on there would just get swallowed up by the depth and the darkness of the piece so I removed it from the room. Thus removing the opportunity to have any more piles. The pieces that I will be using as is or repurposing are the bed, the lamps, the dresser and the nightstand. Everything else will be a new addition. I had a desk from another area that I thought would be perfect in his room and go along with the look. The dresser was my older daughter’s when she was little and then it was in the nursery when my other daughter was a baby. He has had the nightstand for 15 years. Over the years it has been moved 6 times, chewed on by the dog, the trim has come off and it has a water damaged top. Both pieces will soon be suitable for a teen boy and pleasant to look at. They are good, solid pieces of furniture and I knew they could be given a new life with a little work. I started with the dresser. I removed the hardware. Then I sanded the top down to bare wood and stained it. For the actual dresser and drawers I used Miss Mustard Seed Milk Paint and added a bonding agent so I didn’t have to sand. I mixed a couple of different colors together to create the perfect blue. I had a color in my head that was a midnight almost black blue. The color turned out perfect. I added new cup pulls and now it looks like a new dresser. The bicycle artwork we already had and didn’t stand out much before. But now the colors really pop with the new tones of the dresser. I then added pops of red around the room to tie it all together. I also had the lamps but they look so much better on the wood tops of both the dresser and the nightstand. I painted the nightstand in the same midnight color. The top was ruined by water over the years and chipped along the edges and it was missing trim. I thought about taking off the entire top and making a new one but, after a trip to the hardware store, I opted for just a thin piece of birch plywood for $10. I cut it down to size and after adding some pine trim to the sides I stained it all. I left the knobs the same. I kind of like the rustic look and little imperfections like the teeth marks of our son’s favorite dog that has passed away. After both of these projects were done, I couldn’t believe how stunning they are. I didn’t want a bedskirt around his box spring but also didn’t like looking at the unfinished fabric that it was covered in so I opted to wrap it. I chose a $10 drop cloth that was the perfect size to cover the box spring. I love how it has a Restoration Hardware feel and looks like linen without the cost. It really meshes well with the room. I love the seam that I was able to run down the center of the cover for additional interest. I simply wrapped the box spring like a present and stapled it on. Now it looks finished. While I was at the hardware store I grabbed some 1 x 2 and 1 x 3 1/2 boards to make some simple picture ledges. I cut them to 36″ long and glued/nailed them together. These are a great solution for saving space as well as eliminating the potential for any shelves to become a landing strip for everything. With the left over drop cloth fabric I hand painted a monogrammed pillow. I also added lots of personalization with favorite photos and mementos. I decided on a simple pine board with metal brackets to hold books and other favorite items. Again, keeping in mind that it didn’t need to be too deep. By keeping it all simple and streamlined I opened up the space and made it appear larger. I was also able to achieve the modern feel he wanted in the room. By keeping everything symmetrical and with straight lines I was able to give him the simple look he likes while being able to add warmth with the wood tones. In the mood board I had planned on using a desk that we already own. It turned out to be too deep in the space so I purchased a desk from HomeGoods that fits perfectly. It is the perfect example of having items on your mood board that you think will work but having to go with an alternate plan. Most of the time they do, but you have to leave room for variables like space limitations. I was able to find a desk that had the same wood tone and metals already in the room. I knew it would work because that style/color worked for the desk already on the mood board. I opted not to buy the chair in the mood board, either, and used one that would work just as well that we already had that also would incorporate some leather into the space. I only gave myself 2 1/2 days to do this project. Most of the time I make my drapes but I found some on sale and I needed this room to be D.O.N.E. They were too long so I hung them using rings on the rod and then decided how much I needed to hem them. I always use rings because I think they help the drapes hang better and look more custom. I hung them, measured the new hem allowance and then brought my ironing board in. I used an iron-on tape to hem quickly and without taking them down. EASY! No sewing machine needed! 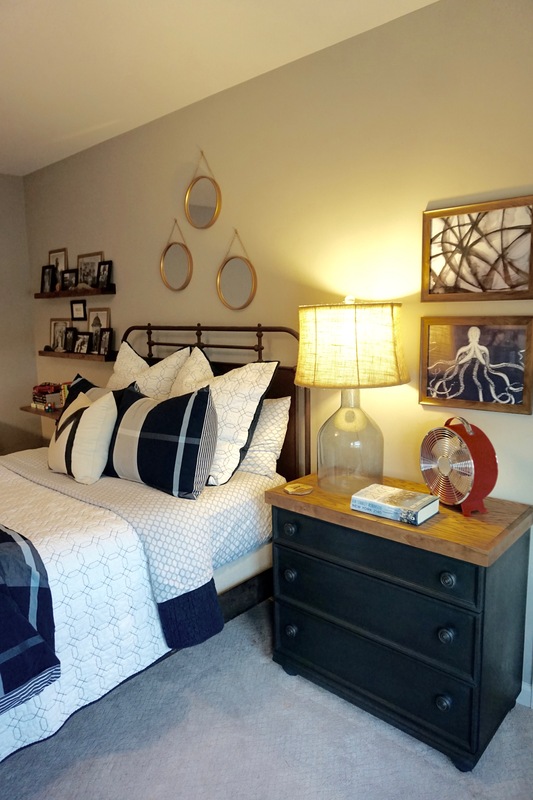 After adding some new artwork and a few other decor items this room was perfect! I love the way the whole thing turned out. He loves it, too! He had no idea that his room could look so great and it was such a wonderful feeling for me to give this gift to him and know how much he loves his new space. I believe that, if we are thoughtful with the way we put things together and have a plan, we don’t have to spend a lot of money to get a great space. I thought about what we already had, put together some ideas on paper, breathed new life into items that were tired and added some inexpensive personalized touches to make a special space for someone to love. I am really happy with the space I created and it made me even more happy to do it for HIM. Watch the video below to see how this room transformed into an amazing, refreshing space!! -Check out the outtakes at the end!